THE STORY - The true story of the unlikely relationship between Ann Atwater, an outspoken civil rights activist, and C.P. Ellis, a local Ku Klux Klan leader. During the racially charged summer of 1971, Atwater and Ellis come together to co-chair a community summit on the desegregation of schools in Durham, N.C. The ensuing debate and battle soon lead to surprising revelations that change both of their lives forever. THE GOOD - Henson’s performance & the universal message of the film that has the potential to be a general crowd pleaser. THE BAD - A simplistic story that offers no nuance or complexity on the subject of race. Rockwell’s character goes through a predictable arc that takes away focus from more interesting elements. It also has a bloated pace makes the film feel too long. ​In the very divided times we live in, many feel aimless in how to bridge that divide and find a way to work together. It can be quite tempting now to completely disregard all those with whom we disagree, but finding common ground can still be viewed as essential in creating progress for the future. However, there are ways in which we can teach these lessons that recognize the nuances we need to work with, and then there are ways in which those messages come across as shallow and pedantic. Unfortunately, this film falls into the latter category, and its best intentions turn out to result in a flat execution. The racial tensions in Durham, North Carolina in 1971 are running extremely high. This is particularly felt between two of the major organizers who have made their opinions quite known. Ann Atwater (Taraji P. Henson) is a civil rights activist fighting against the injustices and discrimination being inflicted upon her community. C.P. Ellis (Sam Rockwell) is the president of the town’s local chapter of the Ku Klux Klan. However, when an electrical fire destroys most of the school designated for the black children, the motion to integrate is put forth. A committee is formed within the community to address the issue, with Atwater and Ellis leading the charges on opposite sides. As they proceed, however, they learn more about each other and come to some revelations that help them grow as people to create stronger bonds. The last bit is where I imagine many people might have some trouble. 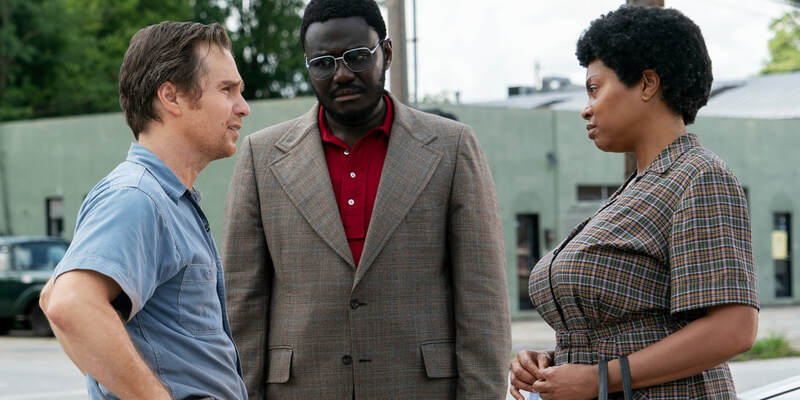 There seems to be a rash of films lately that attempt to take on the subject of not only race in America, but the necessity to reach a mutual understanding on both sides in order to heal. Like many others, this film attempts to find those answers in simplistic, broad terms without ever diving into deeper complexities. It is the film’s biggest weakness, and since it doesn’t show any nuance in its story, it makes the film feel pedestrian in its storytelling. The arcs are predictable and the tone never serious enough for the subject matter at hand. Writer-director Robin Bissell never seems to have a firm grasp of how to authentically tell this story from a perspective that feels anything but surface level. However, I cannot deny how calculated the film is in trying to deliver itself as a crowd pleaser that works in those very basic avenues. You will not find any discussion here that hasn’t already been put forth, nor will many appreciate its attempts to humanize certain members of the KKK, even former ones. Still, the film understands how to indulge in scenes that play to an audience willing to receive it. When that precision strikes to elicit laughter from a glance, anger from the utterance of a racial slur, and cheers for a desired outcome, it’s not difficult to see how successfully this can land. Personally, these moments often felt unearned by the characterizations and came across as empty gestures. But I could imagine how some would feel differently. Henson and Rockwell are two actors I greatly admire, particularly the latter. For twenty years, I have been a great admirer of Rockwell and cheered louder than most when he won his Oscar for “Three Billboards Outside Ebbing, Missouri.” It is true that he inhabits a similar archetype here: a bigoted man who uses that hatred as a cover for his own personal pain. However, whatever your opinions of that film, he had a character that was written with much more flavor than Ellis. Rockwell gives a solid performance, but there’s nothing here for him to truly make this character distinct. He inhabits a predictable evolution that never really feels like something truly extraordinary. It is a performance that is serviceable, but not to the level of the more interesting performances he’s given in the past. Henson, on the other hand, is without a doubt the film’s best asset. She carries much of the film with a great ball of feisty energy that commands the screen. Parts of her performance feel a bit rough around the edges, and she is not helped by an ungainly fat suit, but her natural charisma and fiery persona glues you to the screen. What’s unfortunate is that, despite the equal billing, it feels as if she takes a backseat to most of this story, giving way to the character arc of Ellis. It is the film’s great shame because Henson is by far the most interesting element to the film. The ensemble that surrounds her does their best, but nobody makes the impression that she does. Her story is the most fascinating aspect, and it is limited in its true potential. If there’s any reason to see the film, it is for her. Still, it is disappointing there isn’t more of her in it. One completely understands that the film is trying to convey the message of communication and understanding with those whom we violently disagree with. It is an admirable message to preach, but one should approach this subject with much more delicacy than this film does. Its messaging never searches for anything below the surface, and it comes across as incredibly hollow. Henson gives a very endearing performance, but she gets lost in Rockwell’s story, which only exacerbates the issues of bloat and poor storytelling. This is a film that will find a way to charm an audience into adopting this simple message, and I can attest to being in an audience that found that connection. Sadly, I did not and found myself constantly wanting to see the more interesting story begin. That never manifested, nor did a film I could fully embrace.